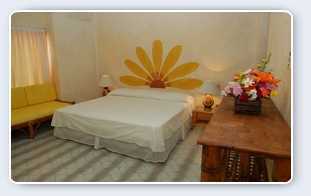 Are our largest rooms on the upper area a king size bed, studio couch and a hot water shower. Down stairs it is a living room a small dinning room and a private kitchen and a small balcony that see the ocean. It is located on the first level and this can found on the ECLIPSE or on the Sun Level. This unit special for peaple that need easy access and also can BBQ on SOLARIUM. Obviously no children on this room.